The first couple of nights at the new house were rough – no power, no water, no furniture. We came prepared though and luckily our neighborhood has a convenience store less than 2 miles away. So there we were with a case of bottled water, a flash light and a sleeping bag crouching around a laptop screen watching How I Met Your Mother. Eric was concerned that neighbors would call the cops thinking a bunch of hooligans were squatting in an empty house with the flashlight light bouncing in the windows. When the movers arrived at 8pm on Friday night, the movers did not help our neighborhood status– by the time they unloaded the truck it was midnight. The neighbors must think that we are trying to keep a low profile (gangsters or witness protection program) thus nobody’s come by to welcome us to the neighborhood (which is highly unusual in Texas). Hot water and cable took relatively long to activate. Three days with no shower reminded me of my childhood in Communist Russia. We used to only bathe once a week and take public transportation cramped like sardines, so this was a non-issue for me. Thus I am immune to the worst of BO. Eric, on the other hand, has not gone more than a day with no shower in the last decade, so he was very uncomfortable. When you live in Texas, having a car is a must. Everything is very VERY spread out (unless you are right downtown). Even mall plaza’s are so big that you need to drive across the parking lot from one shop to another. Austin in particular grew so fast that it will take years for public transportation to catch up. As a single car family, Eric would take the car to work and I would be trapped at the house for the entire day. I was very productive the first day cleaning, unpacking. But once my granola bar supply ran out we knew we needed an alternative. We spent our first weekend in Austin car shopping. Texas is a land of SUVs and pick-up trucks. Transitioning from Corolla to a Dodge Pickup the size of my first apartment seemed too much of a drastic change, so we settled on a compact SUV. We were considering four models: Ford Escape, Toyota RAV, Honda CRV, and Mazda CX5. Ford was a nonstarter since the dealership was closed on Saturday (bad business model). Toyota RAVs only had 2012 models for sale which were very outdated inside (redesigning for next year) and did not offer the best miles per gallon. 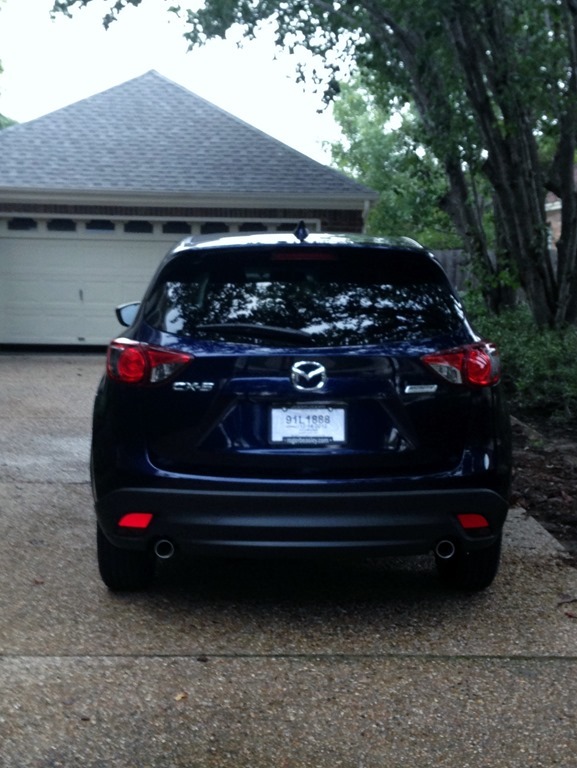 So it came to Honda CRV vs. Mazda CX5 and after multiple trips between the two dealerships, at the end Mazda CX5 won. The Honda would have been our preference if they actually had a better color selection besides grey and brown. Oh, and if they didn’t have fire ants. In Texas, you can’t wear flip flops and not watch where you stand. There are all types of insects that will attack your bare tasty flesh, especially when you are crushing their home like I did while talking to the Honda dealer. The car shopping experience turned into learning the value of boot-wearing in Texas. It’s much more than a fashion statement in the south! At the Mazda dealership we had a much more pleasant experience (at least nobody bit me this time). 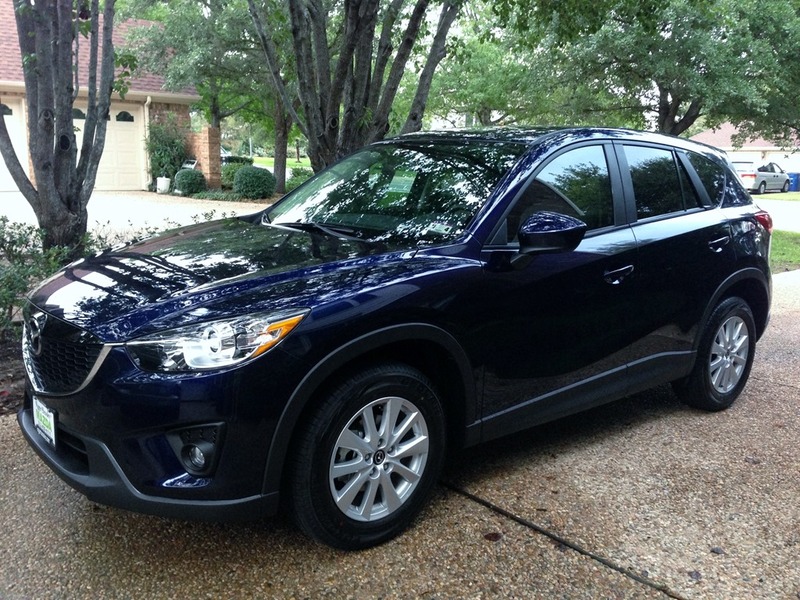 The minute the dealer brought out a shiny dark blue CX5 with light interior, the look on Eric’s face was just as when I walked down the aisle. The car also gets the best mileage (32 mpg highway, 27 mpg in the city). We were sold! The world is in balance yet again– even though it does not (yet) say HTTP, Eric Lawrence is back in his blue-mobile.